We all enjoyed the Steelers Super Bowl Pup Rally at Splash 'n Dash K9 Sports this afternoon. The dogs had fun on the football drills obstacle course and playing the doggie field goal challenge. Both humans and canines came with plenty of team spirit, and we're all cheering for our Pittsburgh Steelers in the Super Bowl tomorrow. Me, Jazz, Tess and Jim at the Pup Rally. 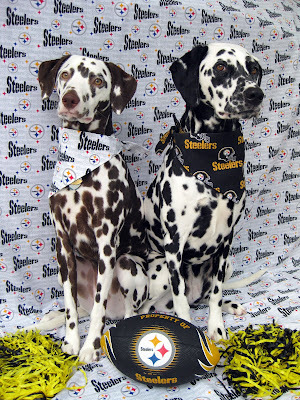 Tess and Jazz wanted to get in on all the Super Bowl excitement and cheer their Pittsburgh Steelers on to victory! Our training club is holding a Steelers Super Bowl "Pup Rally" this Saturday, so I'm sure we'll get some pictures of the festivities to post. Go Steelers! Jazz and I had the pleasure of visiting Green Meadows again with her brother Peet and his "mom" Cindy and the breeder of the puppies, LaDonna. The facility and staff at Green Meadows are wonderful, and the residents are delightful. We got as much enjoyment out of this visit as we hope we brought to the residents! Here's the pet therapy gang sporting our new Therapy Dog t-shirts. From the left, it's Cindy, Peet, LaDonna, me, and Jazz. Here's Peet and Jazz showing the residents how to play the Dog Tornado game. While Peet hadn't ever seen the game before, he caught on very quickly. Smart boy! Peet and Jazz relax a bit during their visit. It's so awesome that Peet and Jazz see each other frequently and Jazz can maintain this bond with her brother. He's one of her most favorite dogs, and she's always thrilled to see her breeder as well. We had several more inches of snow last night, and Tess and Jazz have been out twice already to zoom around in it. They exhibit pure joy in running and playing in the white stuff, unlike their human companions! When we got up this morning, the temperature was below zero and it's struggled into the single digits throughout the day. Since it was so cold, the activity of the day for Tess and Jazz was basking in the sun that was coming into the sunroom. Sunbathing is tiring work and quickly turned into a nap! Here's Jazz dreaming of warmer days and fun in the sun! Here's Tess and Jazz on a quick break from playing in the snow in our back yard. The girls love to get out in the snow, but their play sessions are short, as they both get cold easily and look to come back inside and get comfy!